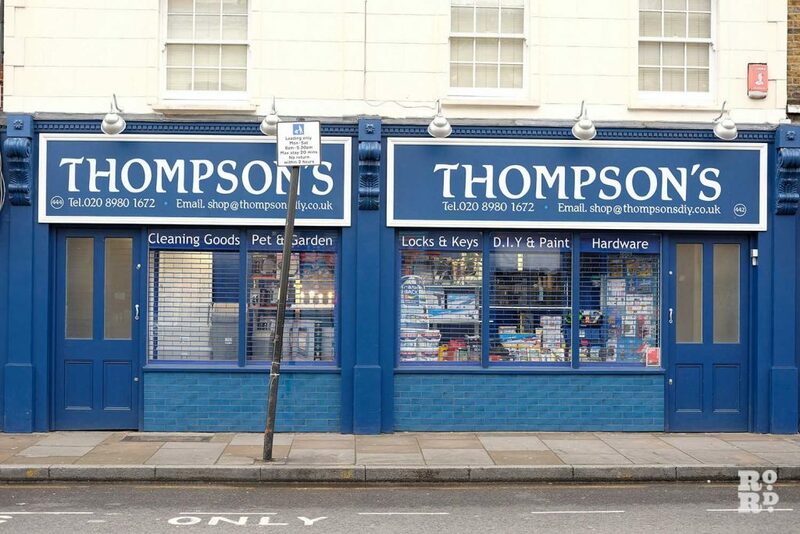 One of Roman Road’s oldest businesses, Thompson’s hardware store has a venerable East End lineage. Passed down through three generations, Thompson’s has been supplying the building and DIY trade since the 1940s and is still the go-to place for all your home improvements. Entering the maze-like shop from either door, you’ll find yourself in a DIY wonderland, the walls lined with some of their 8000 different product lines, and a winding path made by piles of their stock, leading you to their front desk. 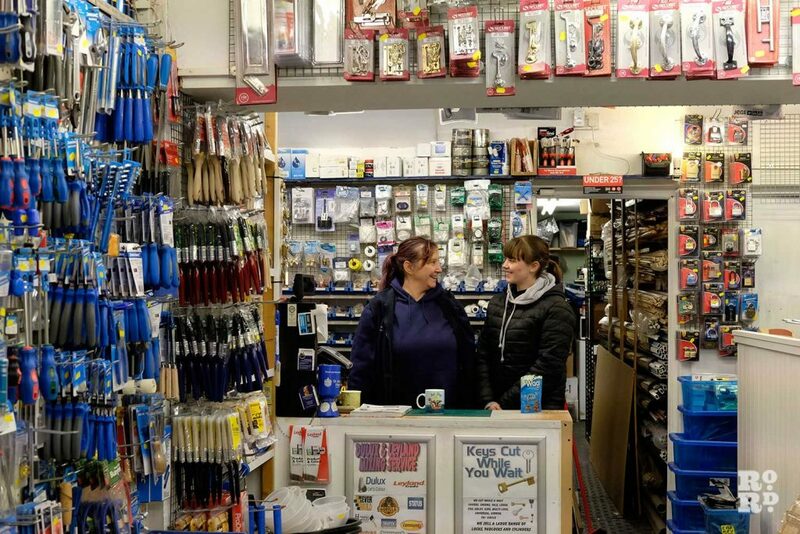 The double-fronted blue shop, near the Young Prince pub, sells everything DIY, including a locksmith service, paints, engravings, electrical supplies, every screw you’ll ever need, cleaning products galore, pet care, and tools for the amateurs and professionals alike. The creatures in this wonderland include two adorable labradoodles – practically furry employees – Milo and Maggie, who will happily greet you from behind their gate. You’ll find Annie Wakerley with glasses pushed back on her head and a cup of tea getting cold on the counter. 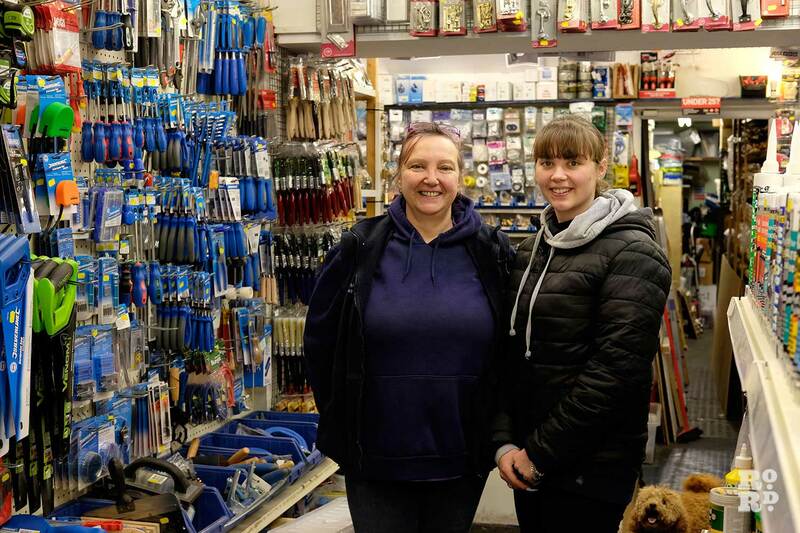 Her daughter Katie Wakerley, who dreams of taking Thompson’s into its fourth generation of business, is a friendly face, unafraid of whatever complex household DIY issue you’ve cluelessly captured with blurry photos on your phone. The men who flank them, Jason and Alan, are also considered members of the Thompson’s family. They’ve been supplying the team with banter and laughs, as well as professional locksmith and paint mixing services, for over 10 years each. The doors, which are always open, figuratively and physically, come rain or high wind, see several locals popping in just for a friendly chat. But Thompson’s glossy dark blue retro signage and shop front is relatively new. It’s hard to believe Thompson’s was once bright orange, sold flowers, hairspray and homeware with their tools, and has been around since the 1940s. Since then it’s been relocated, refurbished by a Tower Hamlets grant, had stalls on the market, and is now entering the digital age with an online platform. Owner Annie and her daughter Katie disclose their stellar history, treasured memories and thoughts on the one-way Roman Road proposed plans this March. Before it became an indispensable feature on the Roman, Thompson’s originally opened on Devons Road in Bromley-by-Bow. 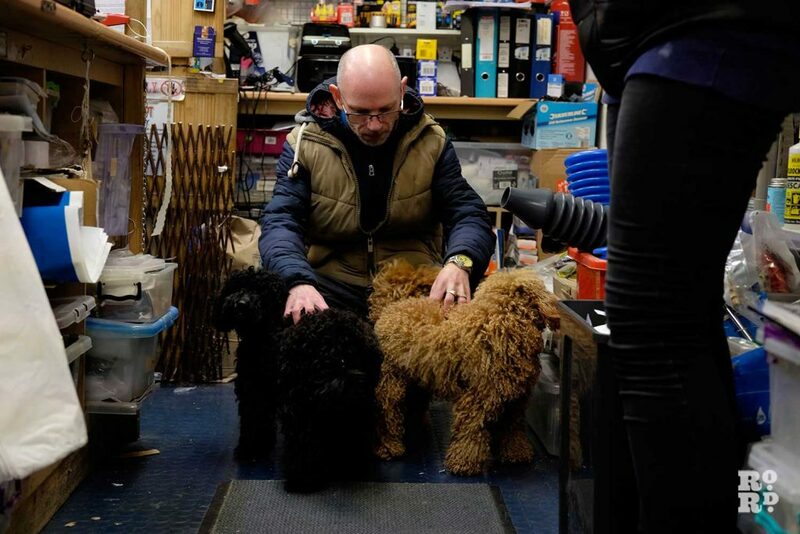 There it started out as a single shop, opened by Annie’s grandparents and uncle, and expanded with business success, buying a shop a door down. This meant that for a while Thompson’s had two shop fronts with a random other store – a chemist – in the middle of it. 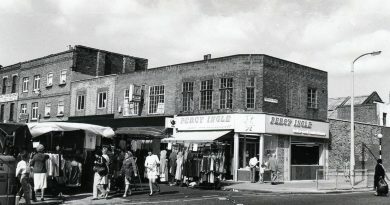 Annie’s uncle, George Thompson, and father Ken, were the ones to move Thompson’s to Roman Road in 1952. It was a smart move, Katie tells us, as they lived locally, on Tredegar Road, and felt that Roman Road’s time was coming. With cheaper rent and an upstairs space for stock, it was ideal and a key part of why Thompson’s survives today. Annie’s parents Ken and Phyllis Thompson ran the shop from the ‘60s. While many people shirk at the idea of working with their partners and being around them 24/7, this wasn’t the case with the early Thompson’s, who made a dream team. They worked side-by-side for seven days a week and saw their business bloom. 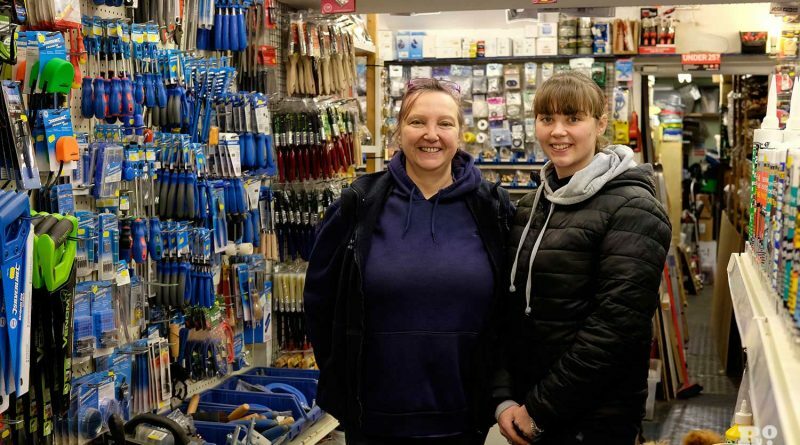 Katie, 19, recalls running around the shop when she was little, ‘Before my nan opened, I’d pretend to be a customer and go around the store collecting things. Then I’d go to the counter and my nan would pretend to put it through, and bag it for me. I was very young but I remember my nan for those moments’. Annie remembers her parents fondly, ‘They were loved and known by everyone. Hundred of local people came to their funerals. They were hardworking, helping everyone as much as they could’. Their commitment to the business is their legacy. Annie adds, ‘They got up at around 4am everyday to get to the wholesalers or flower market to get stock before the shop opened because we were that busy’. When Ken passed away 17 years ago, Annie and her brother, Mark, helped Phyllis continue to run the space. The happily married owners Ken and Phyllis passed away within a few years of each other after reaching the 21st century, with Phyllis passing around 13 years ago. Helping hands Annie and Mark took over the shop and have been running it since. Annie has been working there for over 40 years, beginning by working part-time when she was 14. Katie’s Uncle, Mark, is still part of the shop but runs the maintenance company side, with an office at the back. 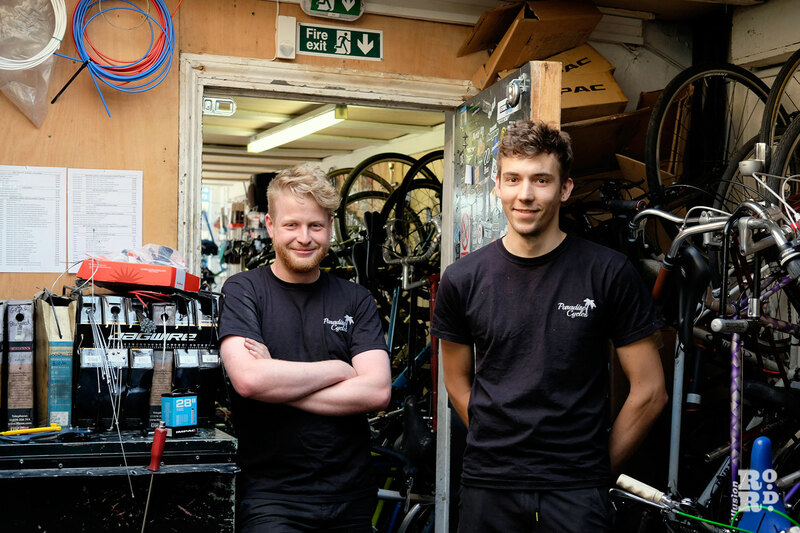 Independent businesses are one of the foundations of the Roman, where most of the high street shops are owner occupied, many with a close-knit family team at its core. Holding off bigger, faceless businesses and corporations, Thompson’s, and their DIY dynasty, is a classic example of this. Annie remembers selling flowers, and the smell of their paraffin product filling the shop. Thompson’s used to go much further back, and was even more of a maze. 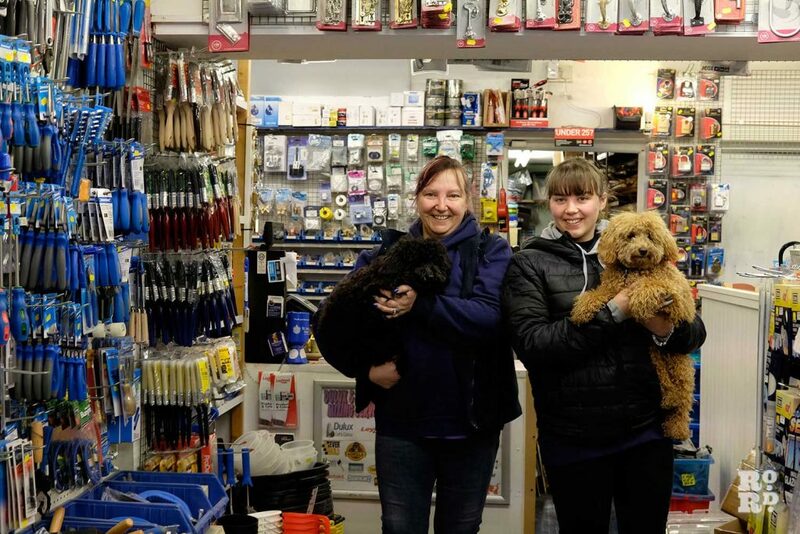 Over time, to become more niche and make their products and services more valuable, Thompson’s have turned more to DIY, paints, tools, locks and pet care. Annie observes that ‘While people used to like to browse and spend time, they now want information, quick and simple fixes and advice’. This is one of their adaptations that set them apart from other DIY stores. 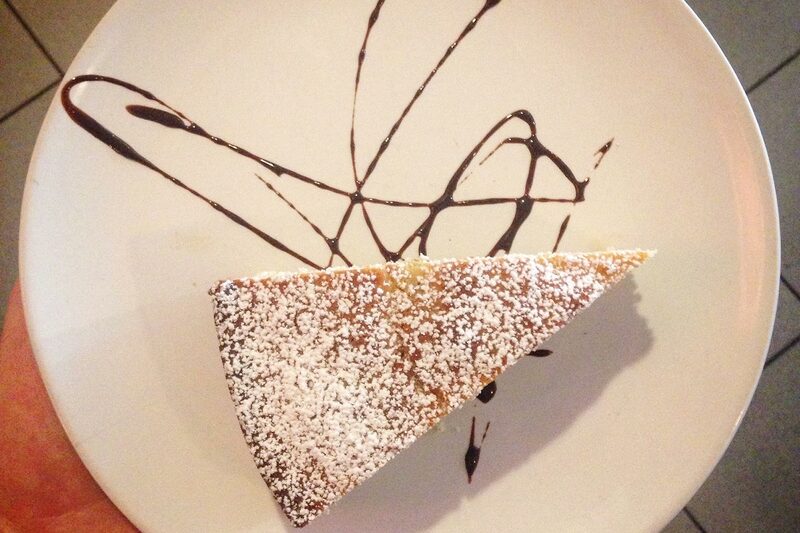 Their extensive knowledge and good service is what locals crave. ‘They want to be helped by people they know and trust,’ Katie says, adding ‘Often people know nothing about DIY, and come in with a problem, or a set of photos of locks on their phone and it’s like detective work to piece together what’s wrong’. Offering solutions is their favourite part of the job. The family have a few choice words and worries about the high street, with the proposed plans for a one-way Roman Road still fresh in the air. The TFL announcement to revamp the road has ruffled more than a few feathers of business owners who can foresee troubles ahead. ‘I don’t think they’ve thought it through. It’s great for cafes but for us, there is no benefit. We don’t have enough staff to have eyes on the road if we put stock out, and we won’t be able to get our deliveries’ Katie reflects. 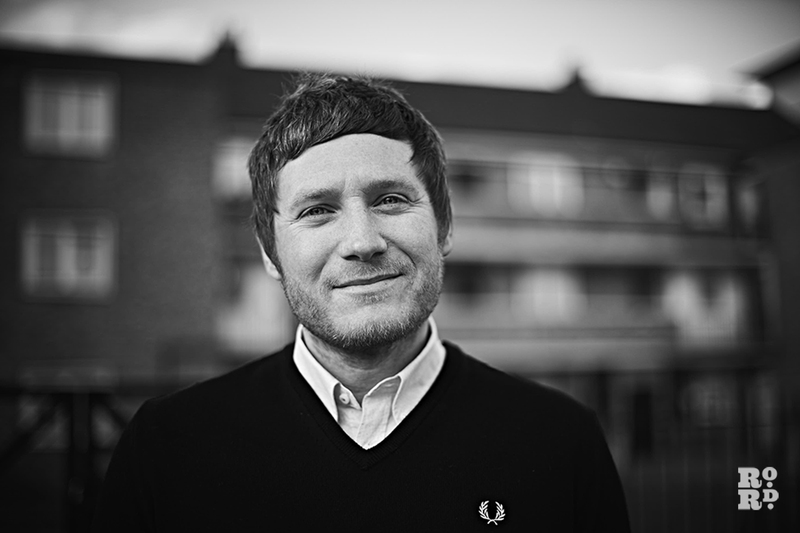 While the plans are still at a very early stage in development, and we’re unlikely to see a change to the Roman for a long time yet, if a one-way system is inevitable, businesses like Thompson’s and their concerns will have to be considered. Looking to the future, Thompson’s now has a website and social media platforms that Katie helped create, and they hope to get the products online at some point too. 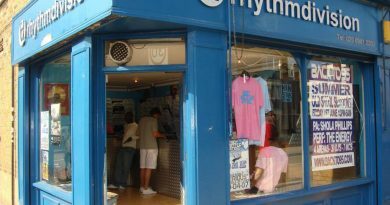 Will Katie taking over the helm, it looks like Thompson’s will be solving Roman Road’s DIY problems for some time to come.